When I broke the surface, and headed for shore on Aug. 20, 2017, the personal enormity of what I had just participated in started to sink in. It had been exactly three years since my accident, and I was leaving the water in the same place as I had been dragged out by my expedition partners in 2014, extremely hypothermic and with the beginnings of the spinal cord decompression sickness that would change my life in so many ways. The challenges involved were multifold. I have significant hypertonia, which is exacerbated by cold, sometimes rendering it nearly impossible to move my legs. I also have pretty profound skin (brush) sensitivity, which feeds the remaining hyperreflexia/hypertonia in some fairly difficult ways. I normally wear short running tights at all times as they leave most of the skin on my lower body uncovered. To revisit this high mountain location in Peru, I would be required to wear long legged clothing at all times for about 10 days, something that I had thought myself unable to do since the onset of the sensitivity. Hiking over irregular ground on informal trails was also going to be a challenge. One of the greatest challenges however, was going to be managing my bladder while living in the dirt, in a tent, in a very cold environment. In short, I was going to be cut-off from ‘civilization’ for a number of days, attempting to hike, explore and scuba-dive in an environment that was hostile to my injury. Preparation for my return began with my first working day at Craig Hospital. When I was first admitted I had little expectation of walking again, let alone hiking and existing in remote areas, though I was resolved to do as much as I could to regain whatever was possible. The staff at Craig pushed me hard, and I pushed myself to work as hard as I could, and little-by-little, I made progress. 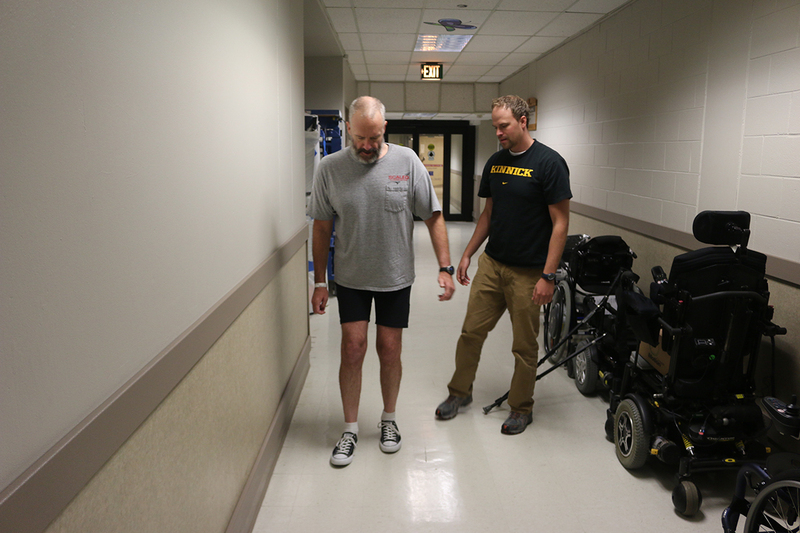 By the time of discharge, I was on forearm crutches and could climb a few steps, slowly and with difficulty. 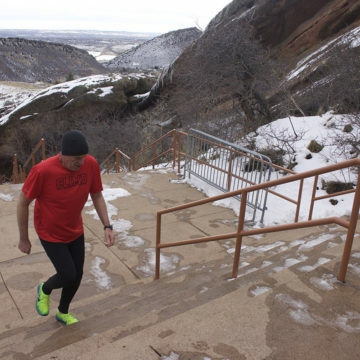 I had hatched a plan with my Craig in-patient physical therapist to attempt a stair climbing event in Denver a few months after discharge. 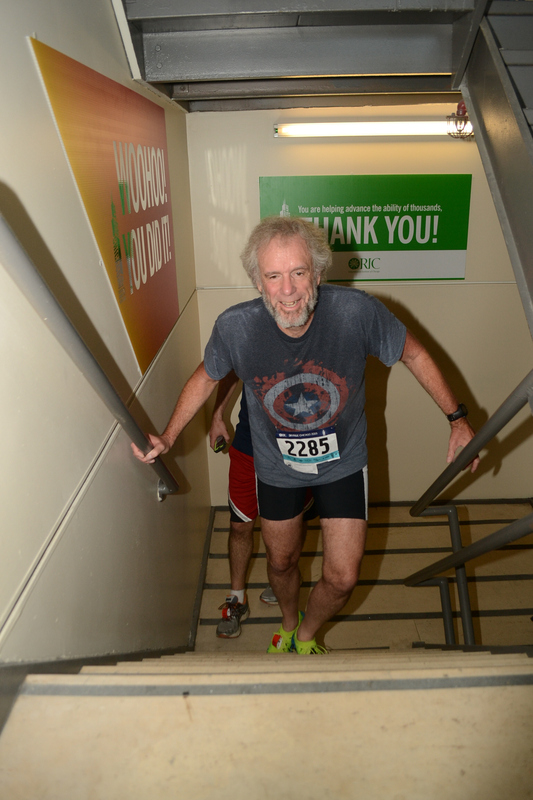 I began outpatient physical therapy with my only goal being completing the 56 floor climb in the allotted time. I still had no real idea that I could scuba dive, hike and exist in the harsh environment where I had been injured. I managed to complete a number of stair climbs, up to 90 floors in the World Trade Center, and I began to push myself harder. I was able to jog a mile, in a painfully slow 15 minutes initially and then a little faster. My physical therapy was unrelenting, lasting two-plus hours a day. I had many setbacks including numerous bloody falls, orthopedic injuries and a bout of drug-resistant sepsis (via my bladder/kidneys) that came close again to taking my life. However, at the end of 24 months post-injury, I started to think it might be possible for me to operate in the high mountains again. I had been scuba diving a few times by then. Though my propulsion was adversely affected, I was able to maintain myself in an adequate way in the water. Serious preparation began about nine months before my return. In early 2017 my original expedition partner announced a return to the site and the possibility of recovering at least one of the ancient artifacts that we had previously documented. When the possibility was first announced, I was full of doubt. I had a reasonable expectation of being able to meet the mobility challenges, and likely the challenges of diving in the cold water, but I had serious reservations about existing in the field at elevation for a week, slowly bleeding core temperature in the 12 degree Fahrenheit nights and managing my bladder issues in a tent in an open environment far from any medical help. I set out working with my physical therapist to address any remaining mobility issues and he sent me out on numerous hikes involving terrain that was challenging to me. I also set about rehearsing the acts of daily living I would have to perform in the absence of plumbing, running water or anywhere the least bit ‘clean’. I set my tent up in the back yard of the house and rehearsed getting into and out of it, as its low position makes it very difficult for me. I also rehearsed my intermittent catheterization routine many, many times in the confines of my tent to make sure I would be able to manage. I even practiced sitting on and getting up from the low camp stools that I knew we would be using. I slowly began to believe that I might be able to pull this off, especially when I found a combination of fabrics and weights that did not set off my skin quite as badly as others had. I developed a protocol to keep my necessary supplies clean and unfrozen and then felt as ready as I thought possible. We had planned the expedition to be on site at the same time as the three-year anniversary of the accident. All of the main participants had been friends and dive partners of my dive partner who perished, and all of us wanted to take this opportunity to memorialize him. On the flight to Lima, I spent a good deal of time alternately musing about the possibilities and rehearsing in my mind all the little things that I needed to do to exist. The couple of days in Lima were spent arranging logistics and visiting with the doctors who had cared for me during the two weeks I was in hospital in Peru. The flight to Cusco was uneventful, as was my brief time there, making additional arrangements and meeting with the archeologists and porters who would accompany us to the site. Driving from Cusco to the trailhead was the first challenge, six hours with most of it being extremely remote. 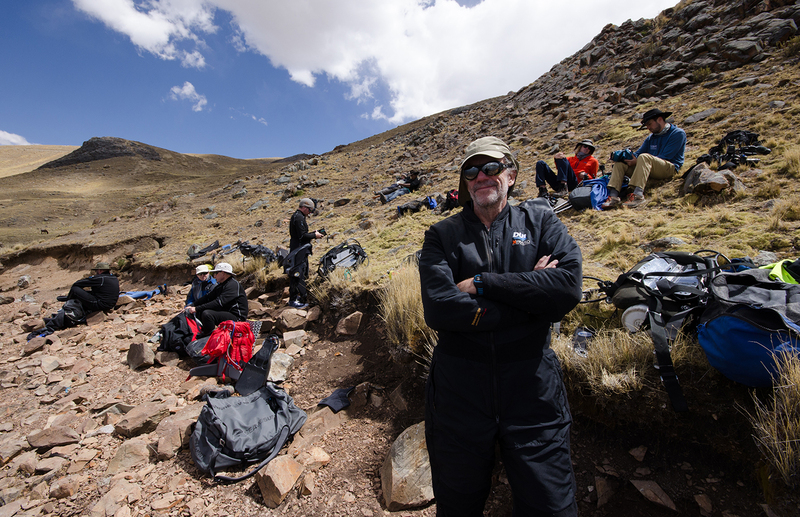 I joked with my compatriots that I was probably setting a world bladder management altitude record by performing intermittent catheterization alongside the dirt road as we stopped at a 17,000-foot pass on the way. The hike in, indeed all of the hiking during the visit, went well. All of the preparatory work that I had done, starting at Craig, had paid off. I used hiking poles throughout, as hiking on the uneven terrain would not have been possible without them. The only injury-based failure I had during the time on the site was my inability to ascend the steep talus slope that led to the summit of a local 18,000-foot peak that the team decided to explore. 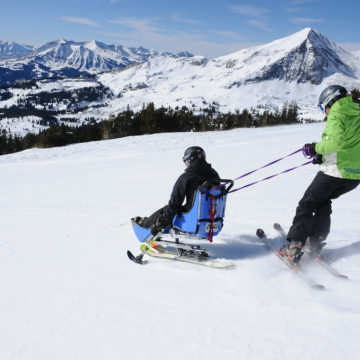 I had to turn around after cresting 17,000 feet when the spasticity in my legs became too much for me to manage. I had no desire to place myself in a situation where my team had to help me down. Our dive to do the pot recovery was scheduled for the anniversary of the accident. It would be a team effort, with team members doing a preliminary clearing of the area, me doing a good deal of digging to excavate the hidden portion of the pot and then other team members placing the pot in a padded crate that I would then navigate to the shore using a lift device to keep it neutrally buoyant under the water. Above all, the work called for precise movement underwater, something that I had been working on for months. All of this went remarkably smoothly, in part because of the rehearsal that we had done on shore. When the crate was lifted from the water and we were all safely ashore, I cried. I cried long and hard for all that we had lost, for all that I had lost and regained, and for a job well done. Later that evening we held a memorial for my friend and dive partner, lost that day three years ago, but remaining in our thoughts for the rest of our lives. There are so many people I can thank for that moment, starting with my family, Craig Hospital and its incredible staff, along with my physical therapist. Finally, I need to thank my expedition teammates from 2014 for hauling my paralyzed body out and my 2017 teammates for helping me to return.